It is pretty well-known that CO2 represents only one part in 2500 in the atmosphere. Water vapor represents one part in 40. Not only is CO2 a wimpy constituent of the atmosphere, it is also a wimpy constituent of the green house gasses. 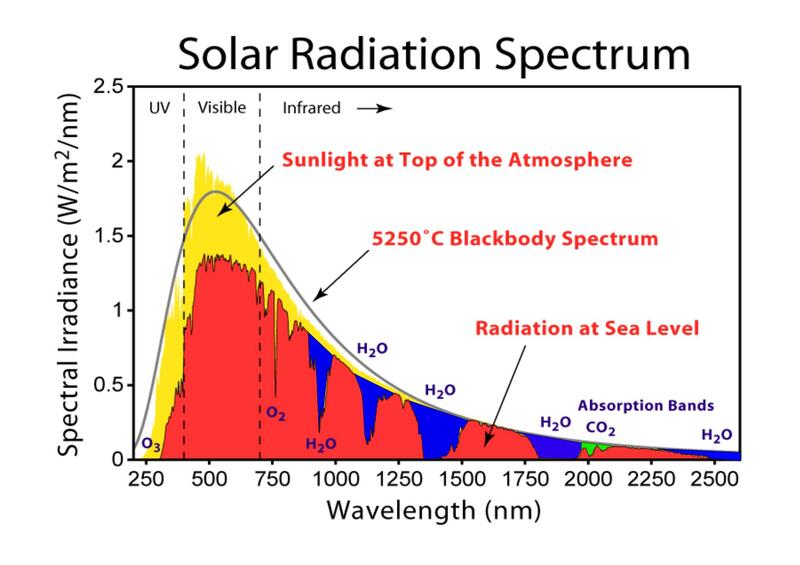 I was looking at this Wikipedia graph of the solar spectrum for another project. It shows the bands and energy levels with notches in the radiation at sea level where greenhouse gasses absorb the incoming radiation. I took the liberty of filling the water absorption notches blue to highlight them. I highlighted CO2 green. These very same bands operate in reverse on the earth’s reflected radiation back to space, giving us in aggregate half of our greenhouse effect. What can I say? CO2 is a wimp! Took a notion to digitize the graph above. Scaled the red area of solar insolation to 1. The blue water absorption holes have an area of .15. The Green CO2 absorbtion area is .005. The units on the Y axis are watts per square meter. Wikipedia says “direct” sunlight reaching the surface is 1050 watts/square meter, but when you add in “indirect” it goes up to 1120. It is not clear if this extra 70 includes back radiation from the greenhouse gasses. Let’s just call it 1120. By our ratios above we get 168 watts/square meter from water and 5.6 watts/square meter from CO2. Together they amount to 174 watts/square meter absorbed by “top down” radiation. This absorption warms the atmosphere. When you look closely at the graph that some of the bites out of the spectrum by greenhouse gasses go all the way to zero and some do not. When you point a meter at the sky and some light gets through in a green house band the band is saturated and allowing some photons through. It is also reflected photons. Your meter can’t tell the difference. When your meter reads zero in a band, you have a black hole kicking gas and taking names. This is where the incoming greenhouse effect is really strong. The H2O bites around 1300 and 1900 microns are not saturated. Carbon dioxide is. This entry was posted in Climate, Global Warming, Optical Material Properties and tagged CO2, Greenhouse gas, the Wimp. Bookmark the permalink.